The Redstart Reports Method dramatically reduces the time needed to dictate a report into any electronic medical records system. Physicians use familiar, notes-style dictation to produce full, formatted reports, increasing efficiency by more than 400%. Contact us for more information about our medical products. 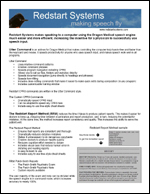 "The Redstart Report Method makes dictating reports faster and more accurate. It's a lot safer. It's fun. You look forward to doing it because there's something magical about it. The biggest advantage is that it takes a lot of the anxiety of speech recognition away -- you are confident that it will not stick something in there that doesn't belong." 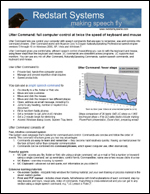 Utter Command works with the Dragon NaturallySpeaking Pro and Medical speech engines. It gives you one-step file, folder and Web site access, and document navigation abilities that outpace the keyboard and mouse. "I work in a fast-paced mental health clinic with high volumes of paperwork. Kim created innovative, customized macros that enabled me to fill out complex forms in a third of the time, virtually hands-free. Kim was extremely helpful throughout the process, giving insightful advice whenever needed. Her enthusiasm, generosity of spirit and genuine helpfulness was much appreciated."